Mu'ammar al-Qadhafi led the revolution that set up the Libyan republic in 1969. His dream was to unite all Arab lands and create a system of "government by the masses." However, by encouraging and helping provide funds for terrorist activities (the activities of people who use violence to try to get what they want) against Israel and its allies, he became an enemy of many countries throughout the world. helped overthrow King Farouk (1920–1965) of Egypt in 1952. Qadhafi began to organize student protests against Israel, which had been at war with several Arab nations after gaining its independence in 1948. He was expelled as a result and moved to the city of Misurata, Libya, where he completed his high-school education between 1961 and 1963. At the same time he began to organize a movement to overthrow King Idris (1890–1983), who had become Libya's first head of state when the country won its independence from Italy in 1951. Qadhafi felt that King Idris allowed Western powers such as Britain and the United States to have too much say in Libyan affairs. After joining the army in October 1963, Qadhafi found more supporters to help his cause. On September 1, 1969, when King Idris was out of the country for health reasons, Qadhafi put his plan into effect. He and his young officers easily took over government and military offices and proclaimed Libya an Arab republic. 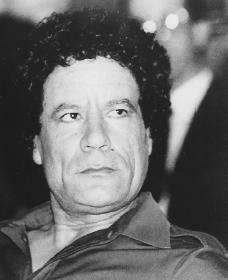 Qadhafi became president of the Revolutionary Command Council (RCC) and had total control over the new republic. Following the example of his hero, Nasser, Qadhafi called for the removal of American and British military bases from Libya. This action was completed in June 1970. Many reforms were begun, including the nationalizing (giving control or ownership to the national government) of Libya's foreign-owned banks and oil fields. Qadhafi spoke out in favor of Arab unity and strongly criticized Israel. He also urged Libyans to follow the strict teachings of the Islamic faith, such as those that ban smoking, drinking alcohol, and gambling. Qadhafi announced the People's Revolution in a speech in April 1973. He claimed that he wanted to involve the people as much as possible in the exercising of political power by creating "elected people's committees." On March 2, 1977, the Socialist People's Libyan Arab Jamahiriyya (a term meaning "government by the masses") was proclaimed. Qadhafi called for the creation of "revolutionary committees" that did not have clearly defined powers but were called upon to "defend the Revolution." Some were worried about what Qadhafi's motives were. As a result, there were many attempts, by both Libyans and the agents of foreign governments, to overthrow or kill Qadhafi in the early 1980s. He survived and remained the unquestioned leader of the republic, even though as part of the Jamahiriyya he had given up all formal titles. Qadhafi was very active in foreign affairs, visiting many foreign countries and almost all Arab lands. He thought it was important to stress his opposition to Israel and his desire for Arab unity. However, his search for political agreements with other countries such as Sudan, Egypt, Tunisia, and Syria achieved only limited results and led to a great deal of mistrust. Qadhafi's opposition to Western interference with Libyan business also led to bad feelings between Libya and the United States. Moreover, the United States accused Libya of supporting armed opposition and terrorist movements in other countries. Qadhafi claimed that his political concept, the Third Universal Theory, came from the principles of the Koran (the Islamic holy book) and was therefore in harmony with Islam. The publication of the three-part Green Book attempted to explain his ideas. It criticized representative democracies (the systems of government in which people elect representatives to make laws) as being dishonest. The book also claimed that political problems could be solved only by the direct participation of the masses in government, as laid down in the Jamahiriyya. Qadhafi also intended to create a business structure under which workers would become "partners, not employees." The Green Book also placed great emphasis on the role of the family. Himself married and the father of three children, Qadhafi lived simply, rejecting all luxuries and vices. As acts of international terrorism became more frequent in the 1980s, Qadhafi drew increased attention as the source of training and funding for such activities. On December 27, 1985, Palestinian terrorists attacked airports in Rome, Italy, and Vienna, Austria. U.S. president Ronald Reagan (1911–) accused Libya of being behind the attacks, but Qadhafi denied involvement. On January 1, 1986, President Reagan ordered all U.S. citizens to leave Libya, and on April 14 the United States bombed the country. Nearly one hundred people were killed in the attack. Qadhafi was injured, and his infant daughter was killed. After two Libyan men were accused of blowing up a Pan American jet over Lockerbie, Scotland, in 1988, killing 270 people, Qadhafi was ordered to turn over the suspects for trial. His refusal led the United Nations (UN) to impose sanctions (business or military measures adopted against a country to get that country to obey international law) against Libya. These sanctions were lifted in 1999 when the two men were finally brought to trial for the bombing. (One man was convicted.) However, a court in France ruled in 2000 that Qadhafi could be brought to trial in France for his role in another bombing in 1989. In that incident, 171 people were killed when a bomb exploded in a French airplane over the African country of Niger. Qadhafi continued to deny that he was a supporter of terrorism and refused demands that he make payments to families of victims. Although U.S. sanctions against Libya remained in place, the removal of those imposed by the United Nations led to new efforts by Qadhafi to improve relations with other African and European countries. At a July 2001 meeting of the Organization of African Unity, African leaders agreed to reorganize the group, to change its name to the African Union, and to work toward greater unity among all member nations. Qadhafi was the leader in the creation of this plan and spent $1 million to support it. He also announced changes in Libya's government, including the dismissal of the prime minister and foreign minister. These changes, along with the executions of suspected spies and opponents of his policies, led many to believe that Qadhafi, remembering how he had come to power, was becoming more and more afraid of being overthrown himself. Blundy, David, and Andrew Lycett. Qaddafi and the Libyan Revolution. Boston: Little, Brown, 1987. Cooley, J. K. Libyan Sandstorm. New York: Holt, Rinehart, Winston, 1982. Haley, P. E. Qaddafi and the United States Since 1969. New York: Praeger, 1984. Tremlett, George. Gadaffi: The Desert Mystic. New York: Carroll and Graff Publishers, 1993.